Pioneers in the industry, we offer 952 glass mosaic adhesive and glass mosaic tile adhesive from India. A multipurpose, polymer-fortified powder offering vast utility including applications for floors & walls in interior & exterior areas. 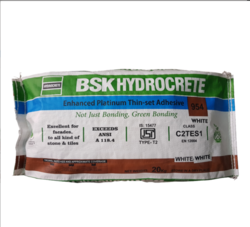 It is a cementitious thin-set powder to be mixed only with water to install various types of medium & large format tiles & stone on variety of substrates using thin-set method of installation. With the aid of adept professionals, we manufacture and supply an optimal quality Glass Mosaic Tile Adhesive. Made of high grade polymer, this adhesive is widely used for fixing glass mosaic tile. The offered adhesive is high in demand in construction industry for its ability to counter the adverse conditions such as external pressures and harsh weather. As per the varied needs of our precious clients, we offer this Glass Mosaic Tile Adhesive in several moisture-free packaging options at affordable prices.